I mark my territory around our home. The best way is with stencils. Just kidding around actually. I am reading a book by Sol Stein on writing. I need to practice opening sentences and what better place to practice than on this blog. 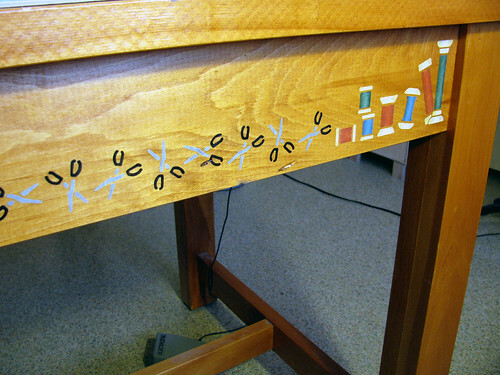 I just saw the stencils shortly after setting up an Ikea table for my sewing machines. These designs are usually hidden under mounds of fabric, cords, you name it. 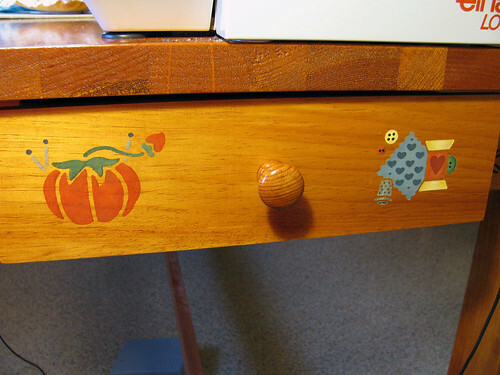 The table has a drawer on one end which is a nice place for all the tools needed to maintain sewing machines. The table is really sturdy with boards running under the top. This design is in the middle of the long boards. I used a spool stencil on the ends. I think I like the tumbling scissor stencil the best because it is so simple. Though critiquing it now, the scissors would have looked better if I had taken the time to paint in the gap in the handles. 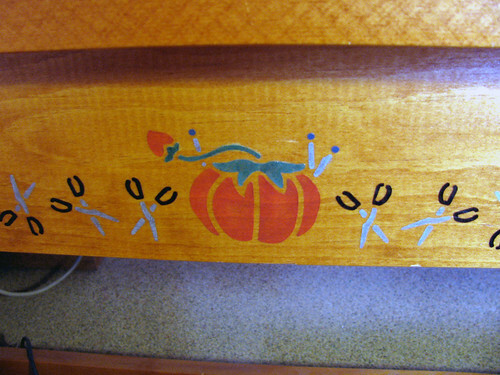 This entry was posted on Wednesday, January 21st, 2009 at 3:00 am and is filed under Sewing and Tools. Tagged: Craft, Sewing, Thread. You can feed this entry. You can leave a response, or trackback from your own site.